This morning we fully welcomed the Foreign and Commonwealth Office (FCO) on to GOV.UK. There are lots of new features and services but a big focus for our team has been building the new Foreign Travel Advice pages. Foreign Travel Advice provides British nationals with official FCO advice about safe travel around the world to help them make informed decisions about travelling and operating in a particular country. 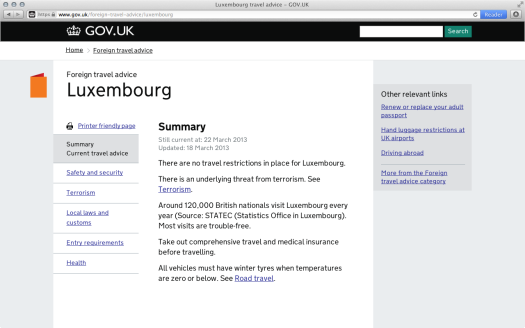 It has been the main driver of traffic to the previous FCO site and is sure to be a popular feature on GOV.UK. 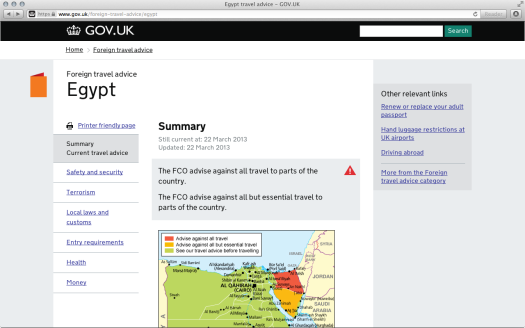 There was lots of information on the old FCO travel advice site but it was buried in long, scrolling pages that were difficult to read and navigate. We’ve clarified user needs, removed generic advice that users can better get elsewhere and focused the material on providing vital safety information so people can make informed decisions about where and when to travel. We have split important information into easily accessible parts, such as Safety and security, Entry requirements, Natural disasters and Local laws and customs. For countries that may have safety considerations there is a clear warning at the top of the page and map to indicate which regions the FCO is warning against travelling to or where precautions should be taken. Users can also subscribe to email alerts for the countries they are interested in. One of the biggest challenges was making the design flexible enough so it worked for both ‘exciting’ countries where there is lots to say and the situation on the ground could change rapidly, alongside the ‘quieter’ countries such as Luxembourg (sorry Luxembourg, it’s a good thing) which had little information that was rarely updated. We dealt with this by giving editors the ability to make different pages and sections depending on the needs of the country. The design works equally well as one page with no parts or one with multiple parts and sections. Part of our mission at GDS is not only building great products but also improving digital capability across government departments. Improving capability isn’t just about skills but also about having the right tools for the job. Foreign Travel Advice is the first time we have devolved publishing on GOV.UK outside of the corporate sections. 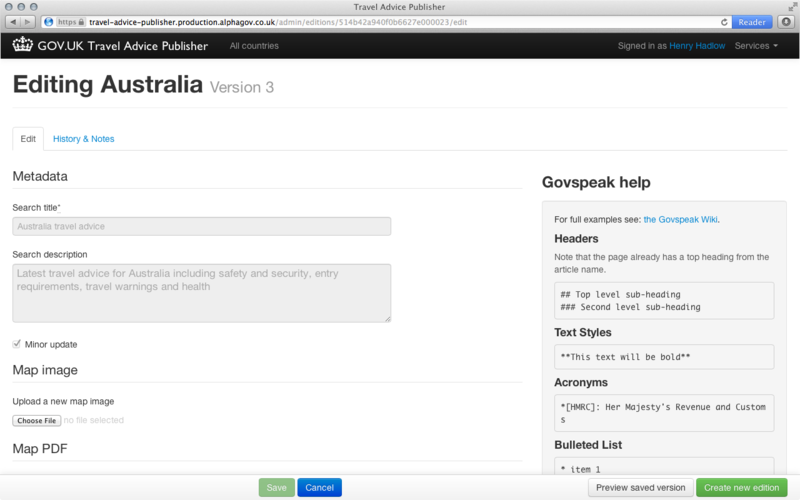 We’ve built a simple, easy-to-use publishing app for the travel advice team at the FCO to use to manage and update the content themselves. Our publishing app replaces an archaic, folder-based content management system that resulted in the team taking several minutes to make even basic updates. The new approach has a user experience to match the simplicity of the front end, and will enable the team to spend time on crafting great content rather than battling technology. We also ran training sessions with editors and created a helpful GDS style guide. We still think there’s room for improving the content and would love to hear your thoughts on what information you find the most useful. It’s not all been about holidays. We’ve also built a whole host of other features, transactions and tools to meet a diverse range of user needs involved in British people travelling and living overseas. This has been a truly collaborative effort and a big thank you is due to the FCO team, especially as they were also working with another GDS team on moving their overseas sites to the Inside Government section of GOV.UK. Today’s launch is another big step for GOV.UK and FCO and we will continue to make improvements as we learn more about how people use what we’ve built. So please let us know what you think. Thanks for the comment. This is very much a first release. Mapping between countries commonly used names and their 'official' ones is something we will improve in future iterations. I'm not sure you've got the balance right. I actually find it harder to get to the information I needed. For example, to find the travel advice for Dubai, I had to search for United Arab Emirates. This isn't what springs to mind for most people.